Coalition forces sometimes pay compensation to civilian victims and survivors of the suffering we have inflicted—but ISAF keeps no comprehensive records, and the US military denies all responsibility. Gunshots shook 20-year-old Jan Agha awake. They woke his father, too. But when the older man pulled aside a curtain to see what was going on in his home, he was shot in the throat and face. Jan Agha lay motionless on the floor, pretending to be dead. Like his father, his mother, brother and sister had all been killed. The full details of the March 11, 2012, massacre in the district of Panjwai, Kandahar Province, may never be known, but the basic story is well established: sixteen Afghan civilians, many of them women and children, were killed and another six injured as US Army Staff Sgt. Robe 1rt Bales stalked from house to house, shooting and stabbing his victims. By the end of that month, the United States had offered the victims compensation. In a country where the average annual income is about $425, the families of those killed in Panjwai received $50,000 for each of their dead relatives, while injured survivors were given about $11,000. The Afghans were reportedly told the money was assistance provided by President Obama. The outsized reparations offered in the wake of that horrific mass murder stand in stark contrast to the compensation offered to most Afghans who have suffered as a result of the US war. 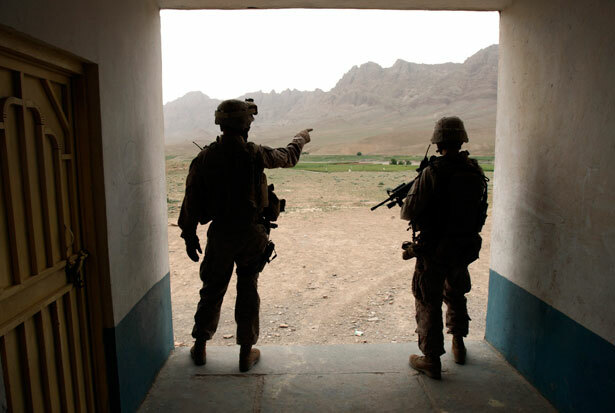 A much more typical case occurred on March 27, 2009, when an American unit on patrol in Kunar Province, traveling in a convoy, rolled through the village of Bar Kanday. There, the lead vehicle clipped a 3-year-old girl who was crossing the street, “causing serious injury to her left arm,” according to military documents. The girl’s father received the equivalent of $392.16. The incident in Bar Kanday is one of hundreds of cases of deaths, injuries and property damage recorded in a 1,000-plus-page archive of US military reparations documents obtained by The Nation through the Freedom of Information Act. The records offer a glimpse of the everyday suffering of Afghan civilians caught in the path of war and the means by which the US military has endeavored to make amends. The files, produced between 2008 and 2011 and released by the US Central Command, were redacted by military censors, who excised almost all names and much of the descriptive information. The collection of “payment request forms” and pay vouchers is neither inclusive nor comprehensive—most of the documents cover only a handful of US units and a few discrete areas of Kunar Province with any depth. Gen. John “Black Jack” Pershing pushed for adopting a system to pay claims to French civilians during World War I, and the US military in World War II found that paying compensation for harm to civilians “had a pronounced stabilizing effect.” But the modern military reparations system dates to the 1960s. During the Vietnam War, solatia payments were a means for the military to make reparations for Vietnamese civilian injuries or deaths caused by US operations without having to admit guilt. According to Spec. Michael Erard, who coordinated solatia payments for units of the 173rd Airborne Brigade, it “was a condolence-type payment…. It in no way implied or implicated us as the perpetrators of this. So we would pay them a certain amount of money for people lost.” In 1968, the going rate for adult lives was $33. Children merited just half that. Today, Afghans can receive as much as several thousand dollars for relatives killed by coalition forces and lesser sums for everything from the destruction of homes to the wounding of livestock, via a complicated reparations system in which multiple funding mechanisms are used. But, as in Vietnam, the United States still denies responsibility. Condolence payments are different from claims and are not an admission of fault by the USG [US government]. It is crucial to remember that when a Commander uses CERP funds, it is not an acknowledgement of any moral or legal responsibility for someone’s death, injury, or damaged property. Condolence payments are symbolic gestures and are not paid to compensate someone for a loss. Money as a Weapon System also states unequivocally that “CERP condolence payments are not Solatia payments and will not be referred to as such. Solatia payments are made for non-combatant civilian casualties, and come from unit OMA [operation and maintenance] funds as an expression of sympathy and do not necessarily derive from legal responsibility.” The meaning of “non-combatant civilian” is confusing since civilians are, by nature, noncombatants, and if the phrase refers to civilians not wounded in combat, it is not supported by the Army’s official regulations governing solatia payments. These, in fact, make no distinctions between combat and noncombat actions, noting only that, as per local custom, “an individual involved in an incident in which another is injured or killed or property is damaged may, in accordance with local custom, pay solatia to a victim, the victim’s family or another person authorized by the victim (such as a tribal leader) without regard to liability.” Documents examined by The Nation suggest that, in the absence of clear rules about various forms of compensation, military units made up their own on a case-by-case basis. The compensation records obtained by The Nation contain solatia payments, CERP project reports and other documents, but no breakdowns of the types of payments or tallies of the funds paid out. According to the Government Accountability Office, the Pentagon disbursed more than $30 million in condolence payments in Afghanistan and, mainly, Iraq from 2003 through 2006. In 2006, the United States paid out just over $352,000 in solatia and condolence payments in Afghanistan. In response to a request for a complete accounting of yearly solatia payments, military spokesman David Lakin told The Nation that the United States paid out more than $3.7 million in “battle damage repair” to Afghans in 2010. In 2011, that number jumped to nearly $12 million. Lakin did not respond to repeated requests for clarification about the nature of the payments, what types of incidents warranted compensation, and why the payouts tripled in just a year’s time. When The Nation requested figures for 2012 from ISAF headquarters, the spokeswoman, Maj. Lori Hodge, said that available figures were muddled. “I could wade through the numbers to the best of my ability but my numbers would be a guess and most likely inaccurate,” she wrote in an e-mail. Although the reparations records fail to capture the scale of human suffering in Afghanistan, they do paint a vivid portrait of the impact of the war on civilians. One 2008 solatia payment request form chronicles a typical example. In the early morning hours of July 17, a US combat outpost in Kunar’s Pesch River Valley came under attack from Saifullah Minah, a village near the base. Troops replied with mortar fire, which slammed into a home, killing a girl, about 12, and her mother, 35. By the time soldiers arrived on the scene, both had been prepared for burial. The Americans agreed to pay the husband/father $3,000 in compensation. Three days later, another unit received enemy fire from the villages of Matin and Shouryak and responded with four ground-launched missiles. The results of the US counterattack were catastrophic: one civilian dead, fourteen wounded, fifteen homes damaged and thirty-one animals slain. The victims and families received $11,070 in compensation. On April 4, 2009, members of one US unit decided to test-fire an automatic grenade launcher, lobbing several grenades over a ridge line, which caused serious injury to a 13-year-old boy out collecting firewood. For his pain and suffering, the Americans paid 20,000 afghanis—about $400. In Paktika Province near a forward operating base, a motorcyclist approached a military convoy and “failed to adhere to verbal warnings and hand and arm signal warnings to stay away,” according to US documents. The man then left his motorbike, walked to the center of the road and knelt down to pray. When he rose, he approached the convoy, causing the Americans to fear he was a suicide bomber; they again issued verbal warnings and hand signals. When that failed to stop him, a gunner fired two pistol shots at the man. As he lay bleeding, the troops came to the conclusion that he was not carrying a bomb and attempted to render first aid. Within minutes, however, he was dead. Kunar Province’s remote Korengal Valley achieved some fame in the United States because of the 2010 documentary Restrepo and its companion book, Sebastian Junger’s War. Through both, the American public was offered a vivid view of what life was like for US soldiers serving on tiny firebases and combat outposts in the foothills of the Hindu Kush. What Junger and his reporting partner, the late Tim Hetherington, largely neglected, however, was what life was like for civilians living near heavily armed Americans who, as the film and book chronicle, often unleashed copious amounts of firepower in the tiny valley. Solatia documents from the spring of 2009, about a year after Junger and Hetherington left the region, catalog the destruction visited on civilians. Although the documents contain only that fraction of cases that civilians managed to report and for which the Americans agreed to pay compensation, the records provide ample evidence of incidents in which US troops damaged property, slew or injured livestock, and wounded or killed villagers. On April 3, for example, three bundles from a supply airdrop that was supposed to land at the US outpost missed the drop zone. One struck a home in the village of Babeyal, damaging the roof. Responding to an ambush between the villages of Aliabad and Laneyal on April 15, US troops responded with small arms, missiles and mortars, as well as three 500-pound bombs, killing four goats and damaging a truck. On April 23, three outposts came under enemy fire. The Americans replied with mortars and called in air support, killing livestock in Laui Kalay village. Four days later, US troops responded to enemy fire with mortars, damaging a home and injuring two cows. The next day, an American unit on patrol was ambushed in Laneyal. One of the mortar rounds fired to suppress the attack “experienced a failure,” according to the documents, landing in a nearby village, where it damaged several homes. A coalition soldier stabbing a young boy may be an anomaly, but the US military’s own records indicate that, in Kunar Province at least, Afghan civilians regularly suffered from coalition operations. And there’s little reason to believe that Kunar is an outlier. One day we may have a fuller picture of the day-to-day toll that the war inflicted on noncombatants. Until then, the reparations files offer a rare glimpse of the suffering endured by Afghan civilians caught in its path.